MyFoody, one of the apps designed & powered by Rawfish, has been awarded as one of the best 2017 iOS APPS! 2017 has been a wonderful year for Rawfish and it coulnd’t have ended in a better way! Apart from our awesome Christmas party, MyFoody, one of the apps designed and powered by Rawfish has been awarded as one of the best 2017 iOS apps, for the sustainability category. MyFoody is an app with lists and categorises the best offers in the supermarkets near you. You can find nearly expired products, seasonal fruits and vegs with little imperfections but pretty eatable, saving up to 50% on your grocery shopping, giving your contribution to build a better world, as it’s against food waste! A super achievement for MyFoody and for us at Rawfish, too, as we’ve worked on the design and the iOS and Android development. Just to add: MyFoody has been part of the Rawfish startups acceleration program in Bali! We’ve asked Alessandro Dipaola, Product Manager at MyFoody a couple of questions to picture how it is working with Rawfish. We’ve aslo been able to get some secrets around MyFoody. Curious? We too. The new MyFoody design was born thanks to a first co-design session developed then thanks to your partecipation to the Bali Program. Walk us throughout your experience. The UX/UI has been defined in one week starting from some internal ideas and drafts which have been revised by the design team at Rawfish which has also defined the app user journeys. After another revision, we’ve put together a document including the technical specification of the interface which has been combined to the functional requirements. The documents to list all the activities to be done is essential. It’s actually setting those goals that very different background are working to achive a common goal! What does it mean working with an external team to develop your app and product? Alessandro every 3-4 week is poppoing to our HQ in Vicenza to work side by side with our developer team. Working remotely is awesome but we believe face-to-face meetings are important to improve your problem solving skills! DID YOU EXPECT BEING INCLUDED AMONG THE BEST 2017 IOS APPS? WHAT DOES THIS MEAN TO YOU AS A STARTUP? Alessandro: “Honestly, we’ve been surprised when from the Apple Store we’ve been told our app has been included in the 2017 sustainability leaderboard, especially cause we’re sharing the list with a bunch of big players such as BlaBlaCar and Moovit. YOUR FUTURE PROJECTS? ANY NEW FUNCTIONALITIES YOU WANT TO TALK ABOUT? At Rawfish we think we’ll see Alessandro again soon in our offices during 2018. Have you already downloaded MyFoody from the AppStore? 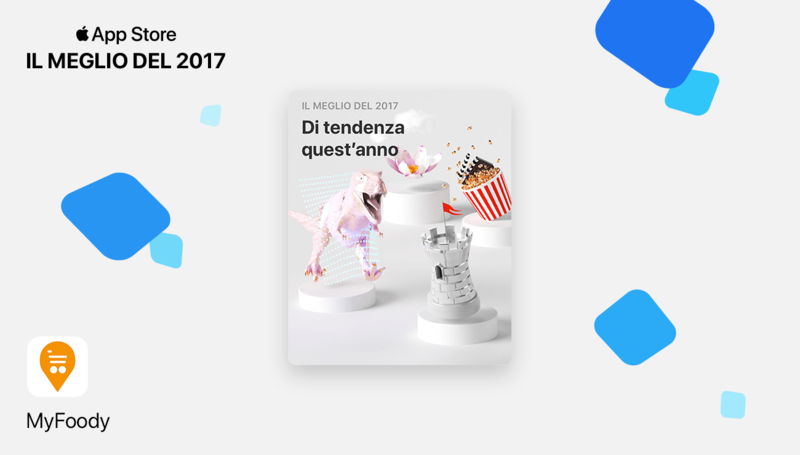 Check on our website the design and the technology we’ve used to develop on of the best 2017 iOS apps!